Panasonic's Toughbook CF-AX2 is a business-rugged convertible Ultrabook that can withstand the knocks and bumps of everyday usage, as well as survive modest falls if it should ever slip out of your hands. 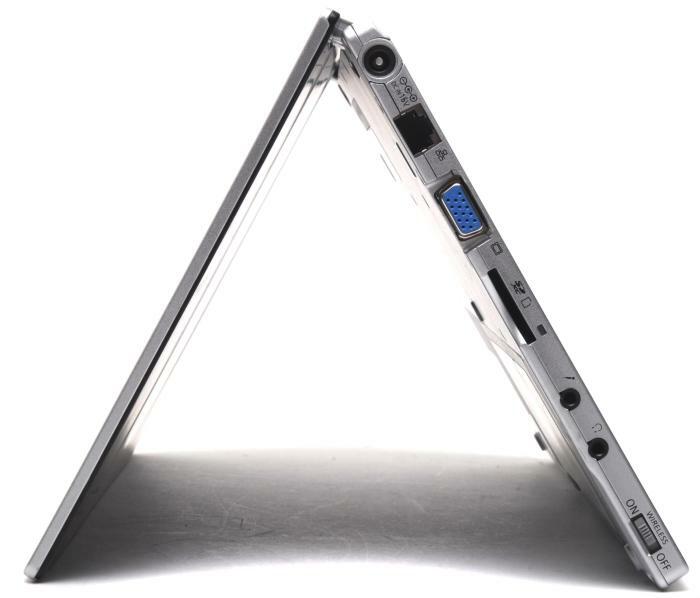 What makes it stand out from previous Toughbook products is a hinge system that allows the screen to fold all the way over so that you can use it as a tablet device. That's the best part about this Toughbook by far. It's a convenient and easy-to-use design, and we had no problems at all going from a laptop to a tablet form factor. What also helps here is that the size of the Ultrabook is 11.6in, which makes it easier to handle in this way than a 12.1in or 13.3in Ultrabook. The machine runs Windows 8 Pro and its screen supports 10 simultaneous touch inputs. The screen feels a little more rugged than a traditional Windows 8 hybrid Ultrabook (it's not as glossy or smooth), and it has narrow viewing angles. That said, it never missed a beat while we navigated the Desktop using the touchscreen, and Windows 8 swipe-in gestures were always recognised. Ruggedness is given to the chassis, which can withstand pressure on its lid up to 100kg, and it will survive drops from up to 76cm. The model we received for our evaluation already looked like it had been through the wars, sporting a bit of a dent on the underside of its chassis, and a couple of scratches to the lid. It feels strong to hold thanks to its magnesium alloy base, which is only about 12mm thick (the Ultrabook as a whole is 18mm with the lid closed), and it houses features that most business users need. The one thing to bear in mind is that it's not a water resistant model, so any spills on its keyboard could cause it harm. Around the edges, you get Gigabit Ethernet, full-sized HDMI, VGA, two USB 3.0 ports and a full-sized SD card slot. There are also separate microphone and headphone ports. What we like is the design of the buttons and switches, which aren't easy to press while you're holding the tablet. The power switch is a slider rather than a button, and the volume and screen rotation lock buttons are shallow enough so that they can be easily pressed without being inadvertently pressed. This is important because when holding the device as a tablet, these will be located at the bottom. You also get a physical Wi-Fi slider switch on the side. There's a SIM card reader located inside the battery compartment, too, and the mobile broadband module in this model supports speeds up to 14.4 megabits per second. The left side has the power, Ethernet, VGA, SD and audio ports. The right has the USB 3.0, HDMI and cable lock facilities. The tablet and power buttons. On the inside of its thin chassis, the Toughbook features a configuration that can supply plenty of power for office apps, and this was shown in our benchmarks. It has a third-generation Intel Core i5-3427U CPU, 4GB of DDR3 SDRAM, a 128GB solid state drive (SSD) and the graphics are powered by the CPU (Intel HD 4000). Being a business model, it also has a vPro chipset, TPM 1.2, and a Smartcard reader is an option. It recorded 44sec in our Blender 3D rendering test, 46sec in our iTunes MP3 encoding test, and 29min 45sec in our Handbrake MP4 test. In CrystalDiskMark, its SSD recorded rates of 478 megabytes per second (MBps) and 263MBps for reading and writing, respectively, which are swift results. Its graphics performance is typical of integrated Intel performance and this means it won't be able to handle too much 3D processing, but it will be fine for some basic tasks, including running relatively simple games downloaded from the Windows Store. In our battery life tests, in which we disable power management, enable Wi-Fi, maximise screen brightness and loop an Xvid-encoded video, the battery lasted 3hr 52min, which is very good for an Ultrabook in this test. Actually, this is a result from two batteries. The Toughbook has an internal battery, as well as an external one that's removable. 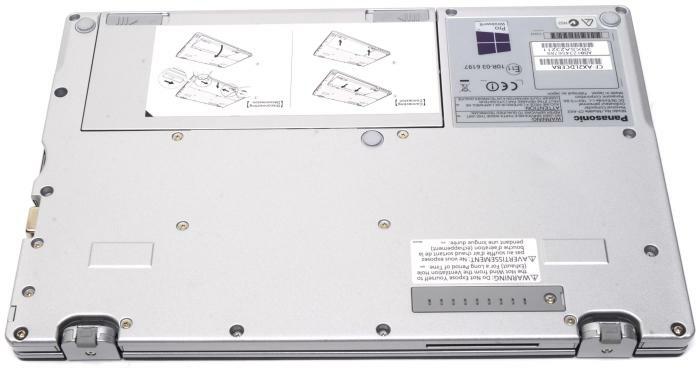 The removable battery is hot-swappable, which allows for easy replacement and prolonged life when the laptop is being used in field locations. The battery compartment is in the top-left of this image. We used the Toughbook CF-AX2 mainly in its tablet form factor. Because its keyboard base is attached, it won't be as agile as a pure tablet such as Acer's Aspire P3, for example, and at around 1.2kg, it does feel a little heavy. Furthermore, you have to be mindful of the way you hold the unit in tablet mode, mainly so that you don't block the air vent. The air vent is located on the left side of the chassis when looking at it from the front in laptop mode, and it's important because during our tests the fan rarely stopped spinning. It's a dynamic fan that spun quite fast at times, making a noise that isn't out of line with other slim, Core i5-based Ultrabooks that we've seen, and it spun up every time the CPU had to process something. The longer it was used (for Web browsing, for example), the longer the fan spun and the louder it got, and this became annoying. You could probably sit the Toughbook in this fashion when giving presentations. The hinges that hold the screen and allow it to rotate all the way around have two mounting points: one which allows for the screen to be tilted all the way back, and another that then allows the screen to fold over the bottom of the chassis. It's a similar design to the Lenovo Yoga, which is a laptop that hasn't found its way to Australia. 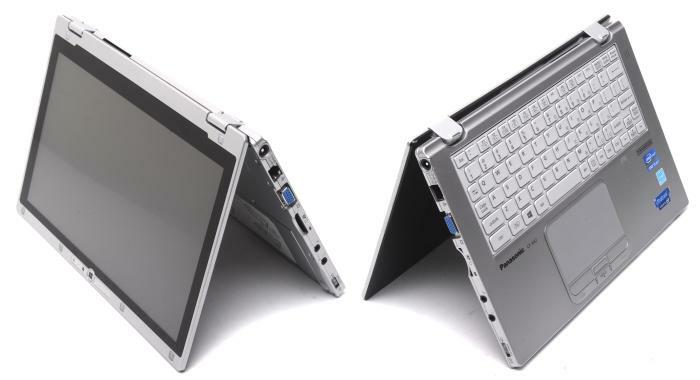 Like the Yoga, the keyboard is always exposed when you hold the Toughbook as a tablet, and it can feel awkward. The good thing is that even if you press down on all the keys, they are disabled in tablet form factor and won't cause you any problems. We like the hinge mechanism, which allows the screen to flip all the way around, but the keyboard does remain exposed in this design. You can use the Toughbook CF-AX2 as a conventional laptop, too, but it's this aspect of the device that we're not so pleased about. Being an 11.6in model, its keyboard is just way too small. Panasonic has packed in a lot of keys and made the layout of the board a little too awkward to get used to (the Delete key is not in the top-right corner, for example). Coupled with small keys (especially along the bottom rows), typing errors are bound to happen (and they were a regular occurrence for us). It just felt way too cramped and awkward to type on for any lengthy periods; basically, it was only useful to us for typing in form data, and we could have done that with the on-screen keyboard in tablet mode anyway. We had no fun attempting to write this review on its keyboard. We've made similar comments about previous Panasonic Toughbooks in this product family, such as the CF-C1 a couple of years ago. The keyboard is way too cramped. The space bar is too small and the location of keys such as Delete is awkward. 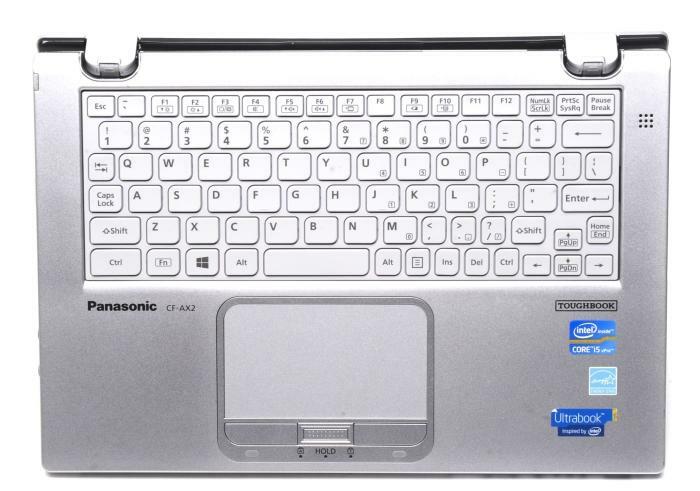 Panasonic has definitely come up with a product that we think in interesting as a Windows 8 convertible product, and we love that it has so many useful built-in features, such as the ports along the edges, the mobile broadband, and the hot-swappable battery compartment. However, as a dual-purpose machine (being a laptop and a tablet), it's not ideal. The keyboard is way too small and cramped and we didn't get much use out of it. We think that a re-designed keyboard with larger keys and a conventional layout would make this product a much better proposition. As it stands, you should consider it if you want a semi-rugged tablet with a keyboard that will only seldom be used for tasks such as entering form data.